FOR RENT / FLOORS AND / OFFICES / GEO. R. READ / & CO. / 373 FIFTH AVE. This was the uptown office (with its entrance originally at 3 E. 35th St.) of the real estate agent, George Rowland Read (1849-1927). The main office was downtown at 20 Nassau St. and 30 Nassau St. The uptown office opened around 1907. These ads from 1914 and 1915 show these addresses. According to his obituary in the New York Times, 12 Nov. 1927, p. 17, Read was born in Brooklyn and, "came from one of the oldest families on Long Island. His first American ancestor, Josiah Read of Devonshire, England, settled on the island in 1643." He was "a son of George W. and Rowland Curtis Read ... Before he founded his own company in 1885, Mr. Read had been for some years a member of E. H. Ludlow & Co." Another member of the firm was George R. Read's son, Newbury Frost Read (1887-1950). Newbury Read is cited in his Times obituary, 8 Feb. 1950, p. 27, as an authority on Charles Dickens: "Mr. Read was the author of a chronology of Dickens' works and was co-compiler of a map of places mentioned by the British author. He was a life member of the Dickens Fellowship, London." This portrait of George Rowland Read appeared in Moses King's Notable New Yorkers of 1896-1899 (1899). This advertisement for Geo. R. Read, Real Estate appeared in Moses King's Photographic Views of New York (1895). George R. Read & Co., was founded in 1884/85 and remained in business until around 1959/60. Click here for 1884 classified ad from the New York Times (with Read misspelled REED!). Read maintained an office here on 5th Ave. until around 1940. 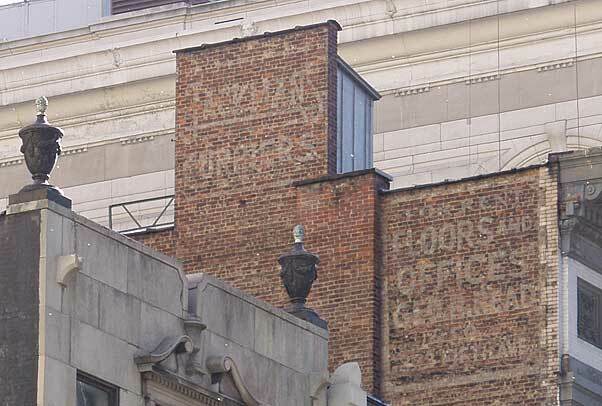 A photo in the New York Public Library's Digital Collections shows this wall when the Read space was occupied by a sign reading "Offices / Showrooms / For Rent / Albert B. / Ashforth / Agent." This photo is dated "about 1915." So the Read sign can be no earlier than this date. Before moving to 373 5th Ave. in 1935 Wm. Jackman's Sons, Furriers was located a half block west at 35 W. 35th St. "Armored trucks and a dozen guards were used to move thousands of dollars' worth of furs less than a block, from 35 West Thirty-fifth Street to the northeast corner of Fifth Avenue and Thirty-fifth Street, late last week ... The furs moved last week included some of the most valuable pelts in the country. The movement was made after dark and additional policemen were assigned to the district from the East Thirty-fifth Street Station" (New York Times, 10 Feb 1935, p. N4). Jackman's was founded in Cleveland in the 1860s and expanded to New York in the 1890s. The founder William Jackman (1829-1899) was succeeded by his two sons Charles A. Jackman (1869-1950) and Edward F. Jackman (1867/68-1940) around 1900. Edward died in 1940 age 72. Charles retired in 1949, then died a year later age 81. The New York business was originally on Greene St., then Mercer St. They moved uptown to 11-13 W. 32nd St. around 1909. Click here for ad from 1909. This advertisement for Wm. Jackman's Sons appeared in Dry Goods Reporter, 1 Nov. 1913, when they were located at 11-13 W. 32nd St. The next move was to 35 W. 35th St. in 1915. Click here for ad from 1918. Another Jackman's sign can be seen at the top of 35 W. 35th St. This account of the early years of William Jackman's was included in Albert Lord Belden's The Fur Trade of America and Some of the Men Who Made and Maintain It; Together With Furs and Fur Bearers of Other Continents and Countries and Islands of the Sea, 1917, "William Jackman was born in London, England, in 1829, and when a young man came to the United States and shortly afterward, under the lure of "growing up with the West," went to Cleveland, Ohio, where, in 1860, he established a wholesale fur manufacturing business, which steadily increased in volume from year to year quite to the limit of his hopes - really outgrew the foundation, and became big enough to transplant a branch in New York, which in turn has developed into a house of first rank. The expansion was wholly due to the painstaking industry, strict integrity and unswerving fidelity of the early resolve to give full value in every transaction. In August, 1889, Mr. Jackman received in partnership his sons, Edward F. and Charles A. Jackman, the firm becoming William Jackman & Sons, and so continued until April 7, 1899, when William Jackman died, and the style of the firm, in consequence, was changed to William Jackman's Sons." The 5th Ave. sign probably dates from the mid-1930s when Jackman's moved to this location. The New York Jackman's closed in the early 1950s.